The first 51 weeks of 2007 was all about love: finding it, having it, and settling into my happy ever after. The final week is still all about it. But I no longer want to be married or engaged in 2008. I simply want to be ready for love, when it finds me. 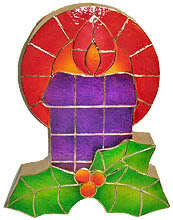 Maybe that's what Advent is all about: a constant forward looking. Maybe that's what Christmas is all about: a constant hope, fresh start and new beginning.